Car dealers love to get you to test drive one of their vehicles. It's one of the things they aim for when they interact with a new customer. They know test drives increase the likelihood of purchase. You experience all those new sensations: that new car smell, no stains on the seats, and all the latest gadgets. It makes the car that much more enticing. However, I have found a test drive to be of only limited benefit. I like to rent a car for a week or so and test it that way. We use our vehicles differently in real life than we do driving around the block with a sales man sitting in the passenger seat. We see if the trunk can contain our stuff, how the car reacts in a more diverse range of traffic conditions, and whether it fits the way we live and drive. This kind of gives me a much better sense of whether the vehicle will work in the day to day needs of the real world. To invest in a car that fails to, say handle steep grades if you live in the mountains or (as in my particular case) one that can't haul a lot of kids with large bags of hockey gear would be costly. Even more costly, though, would be to invest one's life in a worldview that fails the real world test. We live in a culture that currently sees no problem with holding to beliefs that don't square with our real world experiences. For example, recent news events have brought the question of religious liberty and people's right to have their actions be governed by their consciousness into the spotlight. I've seen many letters to the editor like this one from Chris Jacobovitz who states categorically, "Any legislator who lets his or her 'deep personal beliefs' get in the way of making legislative decisions should resign immediately. "1 I would like to ask Mr. Jacobovitz if deep personal beliefs of people like William Wilberforce, who lobbied the English Parliament for twenty years to abolish slavery are OK. Or those of Henry B. Whipple. Of course, Mr. Jacobovitz's view is itself a deeply held personal belief, and thus it should not get in the way of anyone else making legislative decisions. It is common to run into people who think that any kind of personal belief must somehow be distanced from one's public interaction, but this only breeds the self-refuting nonsense like that found in the letter above. It's a small test drive that sounds good at first, but hides its shortcomings. Beliefs must be examined in light of how they make sense of the outside world; they should be lived with and measured. If the worldview is true, it will accurately reflect the real world. And there's no better example of that than Christianity itself. In the book of Romans, the Apostle Paul tells the church at Rome they need to change their worldview. 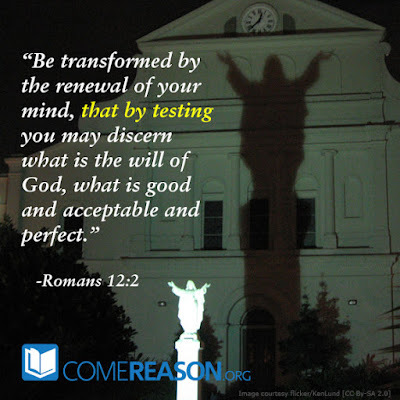 He encourages them to not be conformed to the thoughts and ways prevalent in the world of his day, but to "be transformed by the renewal of your mind, that by testing you may discern what is the will of God, what is good and acceptable and perfect" (Rom 12;2, ESV). The verse is a familiar one, but I like the way the ESV renders it. Instead of the King James "to prove", the ESV uses the more modern "by testing." That is, we can test what is good and acceptable and perfect by living out the Christian worldview and see how it fits. Paul is so confident that living your life sacrificially with your mind transformed will demonstrate the reality and benefit of the Christian faith. He tells the Thessalonian much the same thing, charging them to "test everything; hold fast what is good" (1 Thess. 5:21). I've said before that Christianity knows nothing of blind faith. It is an eminently practical belief system that has a 1700 year track record of bettering lives and bettering nations. There is no other worldview that more closely matches reality than Christianity. Christianity is responsible for the concept of human equality, provides grounding for morality, explains life, consciousness, and provides real meaning for our existence. In other words, Christianity teaches us the truth about ourselves and the world around us. Certainly that's worth investing in. 1. Jacobovitz, Chris. Letter. Los Angeles Times. Los Angeles Times, 10 July 2015. Web. 20 July 2015. http://www.latimes.com/opinion/readersreact/la-le-0711-right-to-die-keep-beliefs-and-votes-separate-20150710-story.html.